So I just realized that yesterday was my busiest day ever with 344 views- thanks to everyone who has been checking this out! Not anything to brag about, but it feels pretty cool to know that people are checking it out and enjoying my rambling! Tonight was another busy night, but I managed to sneak into the garage for about twenty five minutes or so to get some work done. 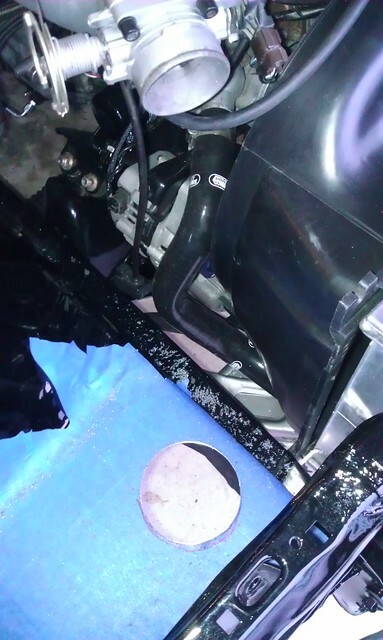 When we replaced the metal where the battery tray used to be, I didn’t have a way to tell where to cut the hole for the intercooler piping without dropping the engine back in. 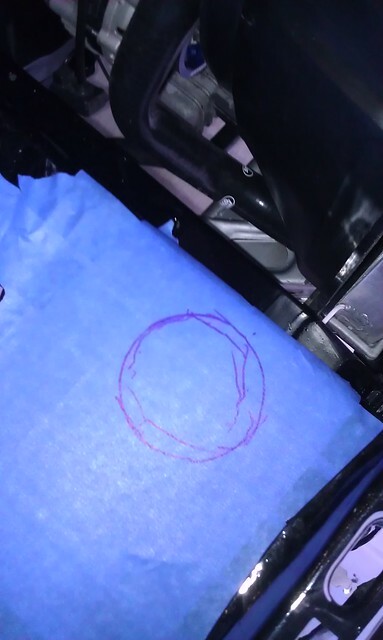 Since that would have been a lot of work, I decided to just cut it after the bay was painted- even though I had no idea how I was going to do it. 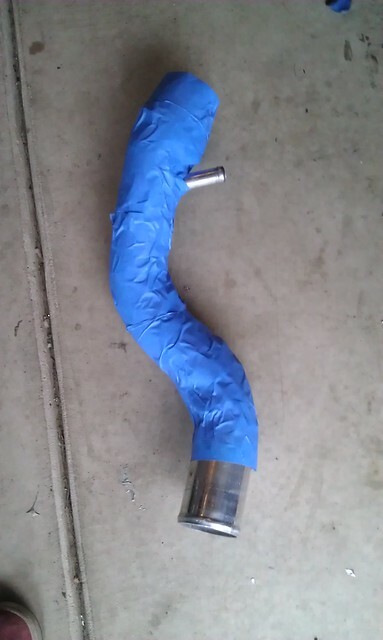 Wrap it again, this time with the sticky side towards the piping. 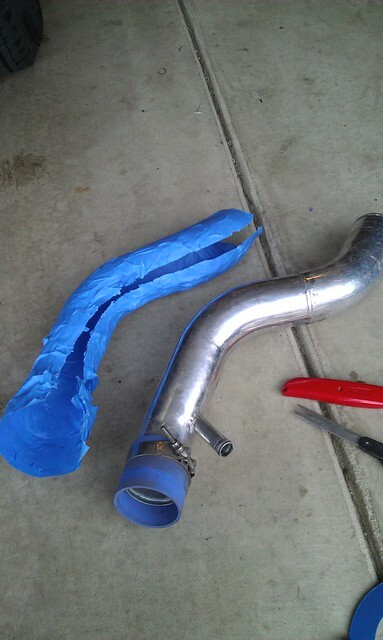 You should have the pipe covered in tape without any stickiness touching the outside or the pipe itself. 5. Cut the hole in the sheet metal. 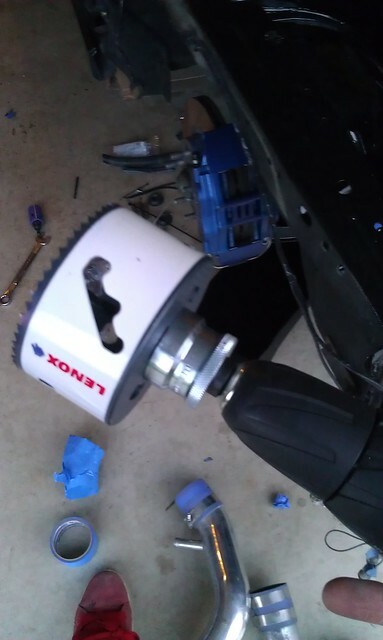 I used my power drill and a 3.5″ hole saw bit that I picked up from Home Depot. And wallah! 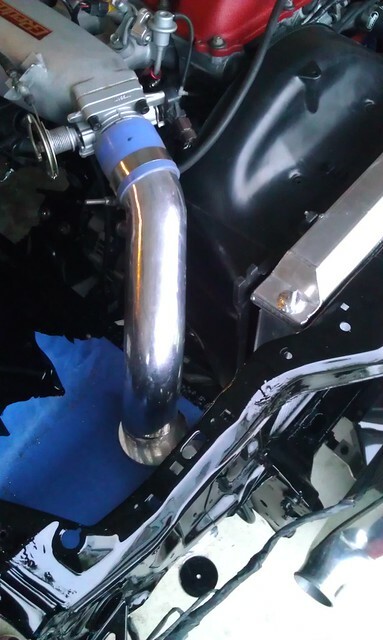 If things went well for you, you should have a pretty solid looking pass-through for your intercooler piping. Mine could have been centered a little better and the hole diamater could have been a little smaller probably, but I am really happy with how it turned out. The size of this hole matches the one in the other side of the bay that was there when I bought the car. I’m really pleased with how the bay is coming together. Keep in mind that I have to make a second pass through and add some more small details- nice hardware, new valve cover setup, -AN fittings and lines, a new fuel setup, etc. For now I am just going to get the car running to ensure that the wiring is in good shape, get the interior back together, and then get into the fine details while I wait for my wheels to be done! Not a lot else needs to be in the bay. 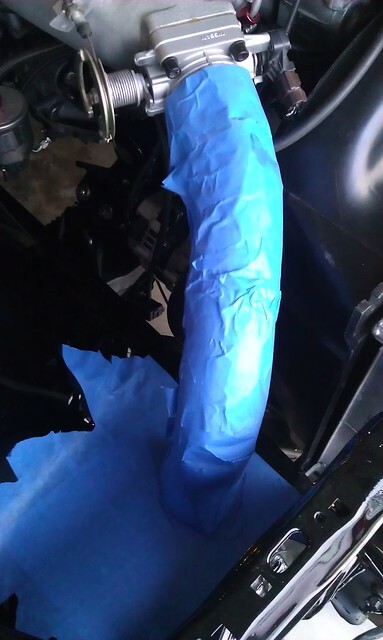 The coolant overflow will be under the cooling shroud, so that won’t be seen. The only other items coming into the bay to make the car run will be the MAF, intake pipe/filter, and the boost controller. Should be pretty happy with it when I am done! Thanks a lot for reading guys- appreciate it! Looking awesome Damon! I’ve accounted for a few of those views lately; keep the work and pictures coming. 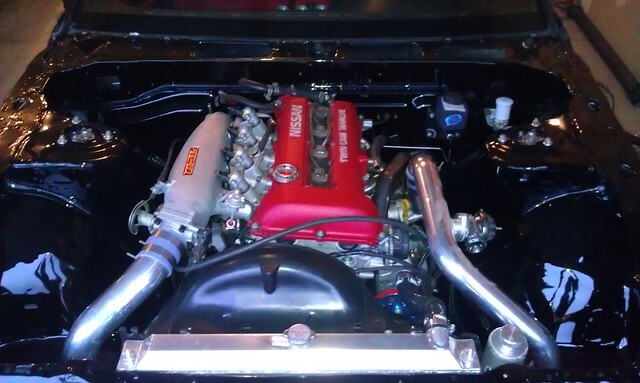 I’d love to put a post on my site with an in-progress pic of the 240 and link to your build here if you’re interested. Thanks man, glad you are enjoying it! You’re welcome to post up whatever you would like. Thanks! I’m having a set of 17/18 Blitz Type 03 refinished at Wheel Flip out in California right now. I’m thinking they will be done about 4-8 weeks from now, but we’ll see what happens! I’m hoping they’re done sooner rather than later! Oh ok cool. Sounds good. So no more TE37’s? Nope, I sold the TEs and shipped them out about a week ago to their new home. I might own another set down the road someday, but for now no more TEs! Ok cool. Looking forward to see your car with ya new wheels! !